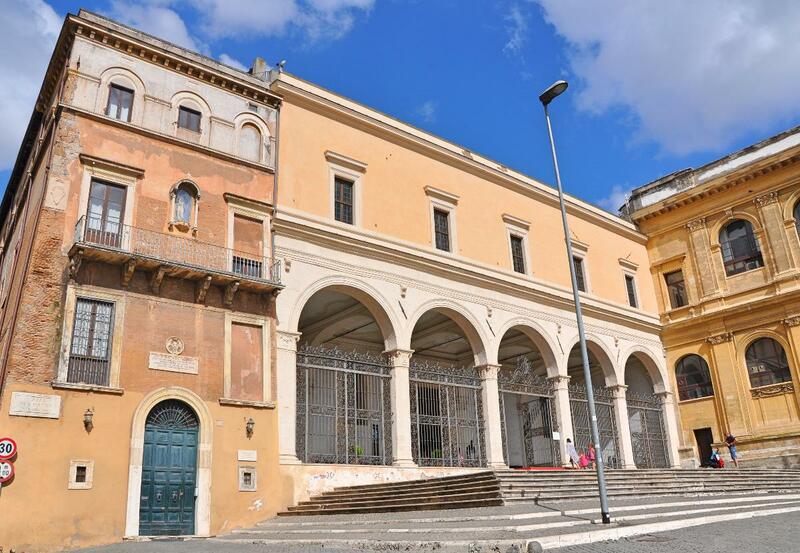 One of the innumerable attractions in Rome which we were able to see last week was that of Michelangelo’s Moses, housed (among other artistic works/artifacts) in the Church of San Pietro in Vincoli. The statue of Moses was sculpted by Italian High Renaissance artist Michelangelo Buonarroti, who created this work in the years 1513-1515. This sculpture was originally commissioned in 1505 by Pope Julius II for his tomb. 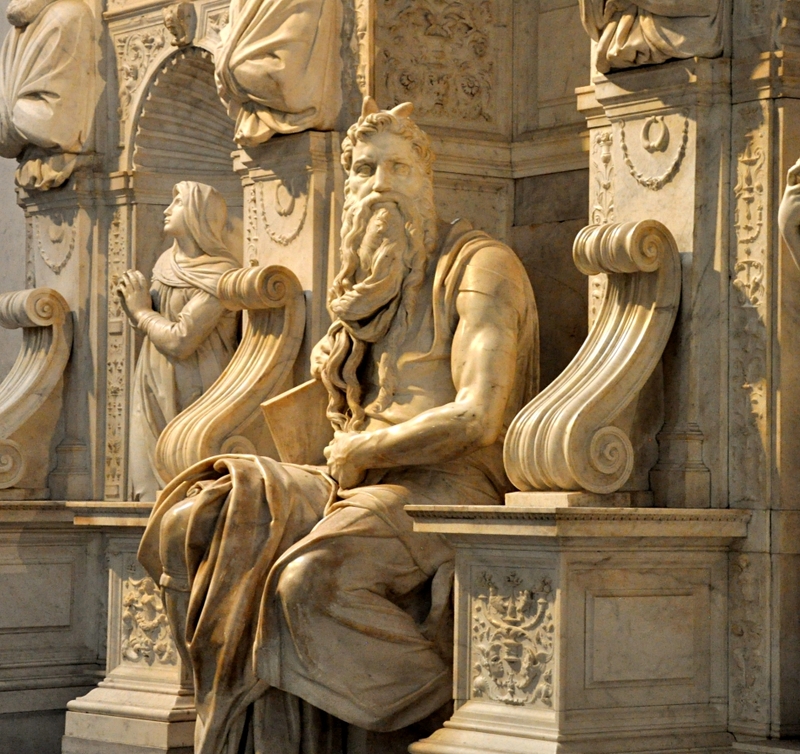 Michelangelo’s Moses, in Rome. Photo ©Leon Mauldin. Moses is here depicted as seated, holding the two tablets of stone. Some suggest the intensity portrayed is meant to represent his holy anger when he cast down the stones upon being confronted with Israel’s idolatry. But to the point of this post, Moses is seen here with two horns on his head. This is based on a rendering of Exodus 34:29 in the Vulgate, the Latin translation of the Bible in use during Michelangelo’s time. The English Standard Version renders the text, which speaks of Moses coming down from Mt. Sinai after talking with God, “When Moses came down from Mount Sinai, with the two tablets of the testimony in his hand as he came down from the mountain, Moses did not know that the skin of his face shone because he had been talking with God.” The Latin Vulgate renders the Hebrew word qaran, “to shine” as “horned.” Hence the horns on Michelangelo’s Moses. The word qaran is derived from the noun qeren in the sense of a “ray of light” (see Hab. 3:4). Something of the divine glory remained with Moses. The Greek translation of Aquila and the Latin Vulgate convey the idea that he had horns, the primary meaning of the word from which this word is derived. Some have tried to defend this, saying that the glory appeared like horns or that Moses covered his face with a mask adorned with horns. But in the text the subject of the verb is the skin of Moses’ face. The statue stands 8 feet, 4 inches and is made of solid marble. Church of San Pietro in Vincoli, Rome. Photo ©Leon Mauldin. This entry was posted on Thursday, June 14th, 2018 at 10:32 AM and is filed under Art, Biblical Interpretation, Italy, Old Testament, photography, Rome, Travel. You can follow any responses to this entry through the RSS 2.0 feed. You can leave a response, or trackback from your own site. I always wondered about the horns depicted in artwork.. It is amazing to see the beauty cast in stone..